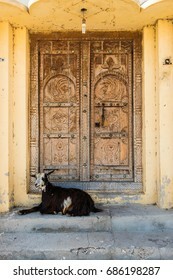 Semi-pro, Bahrain-based, ex-Nikon shooter. 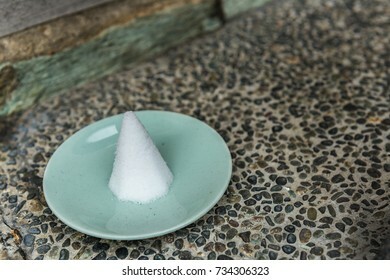 Haven't looked back since I swapped it for my Fuji. 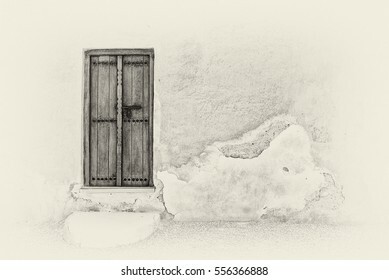 Black and white image of an exterior carved wooden door and step of a restored traditional Arabian house in a wall with sunlight casting diagonal shadows from roof beams. 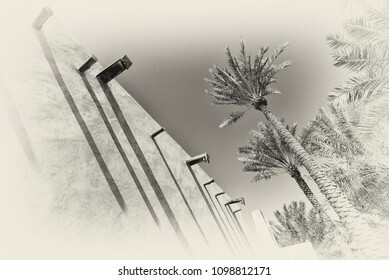 A black and white filtered image of the exterior adobe wall of a traditional arabian house with strong shadows showing palm trees. 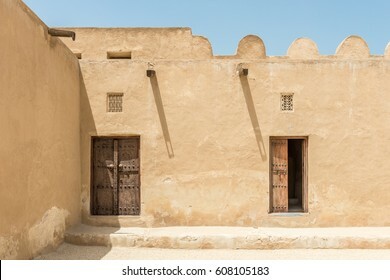 A monocrhome image of the courtyard of a restored traditional arabian house with carved wooden doors, palm trees and stairs leading to the roof. 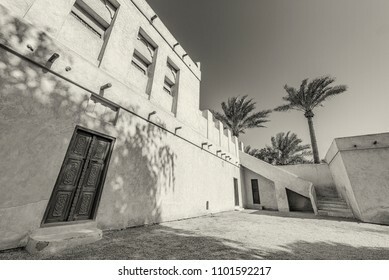 A black and white filtered image of the exterior adobe wall of a traditional arabian house with strong shadows showing palm trees and drains to remove rainwater. 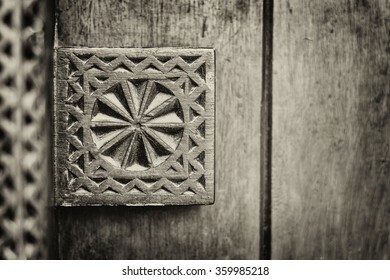 A black and white image of a metal door knocker on the wooden door of a traditional arabian house. 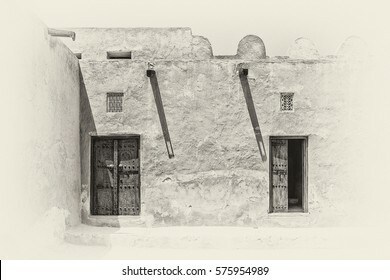 Sepia view of the inner courtyard of a traditional old Arabian adobe house in strong sunlight with shadows from wooden gutters and carved wooden doors and window lattices for ventilation. 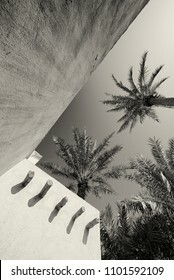 A black and white image of the exterior adobe wall of a traditional arabian house with strong shadows showing palm trees. 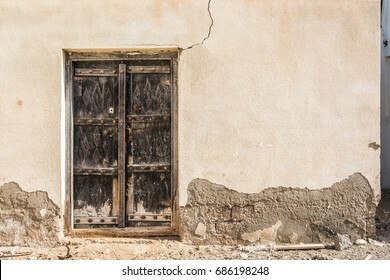 Sepia image of a traditional Arabian carved wooden door with a step in a crumbling plaster wall of a restored house in the Arabian Gulf. 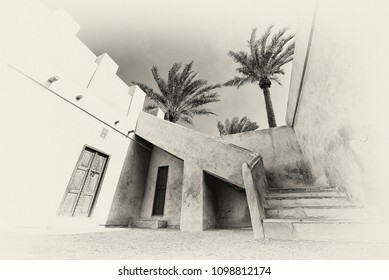 Palm trees tower above an angled staircase over carved wooden doors in this sepia wide-angle ground level view of a restored traditional house in the Arabian Gulf. 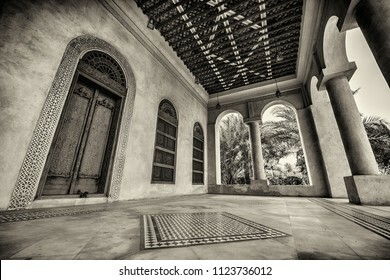 A monochrome image of a porch with carved doors and window shutters and tiled flooring at the entrance to a restored traditional arabian house. 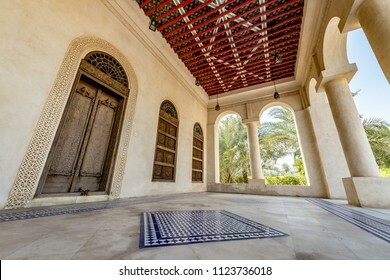 A porch with carved doors and window shutters and tiled flooring at the entrance to a restored traditional arabian house. 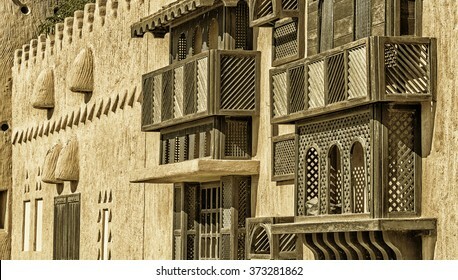 The inner courtyard of a restored traditional old Arabian building in strong sunlight with shadows from wooden gutters and carved wooden doors and window lattices for ventilation. 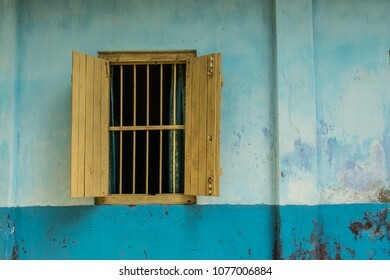 Exterior view of a yellow window with bars and no glass, blue curtains and open yellow shutters in a two-tone blue wall. 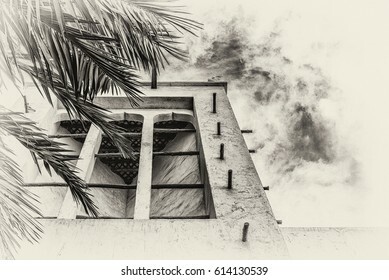 A sepia view looking upwards through the leaves of a palm tree towards a wind catcher, a traditional Arabian ventilation tower on a restored adobe building in the Arabian Gulf. 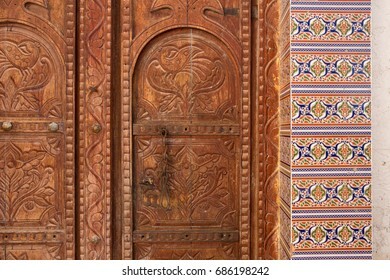 A dual color filtered view of an elaborately carved exterior door with a glass arch and a carved gypsum surround stands in front of a patterned, tiled floor in a restored traditional arabian house. 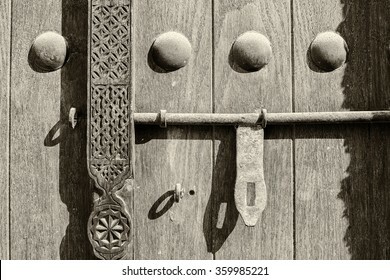 A black and white image of an elaborate metal hinge on the wooden door of a traditional arabian house. In this filtered monochrome image, stairs lead to the roof from the courtyard of a restored traditional arabian house with carved wooden doors and palm trees. 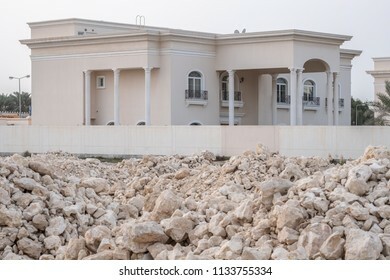 JANABIYA, BAHRAIN - 26 JANUARY, 2018: Piles of stone for construction sit in front of walled private villa with elaborate pillars and balconies. 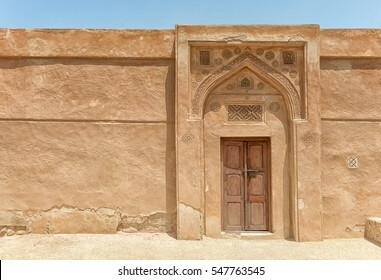 A traditional arched doorway with gypsum carvings and a carved door stands in bright sunlight in a wall of Riffa Fort, Bahrain, in the Arabian Gulf. 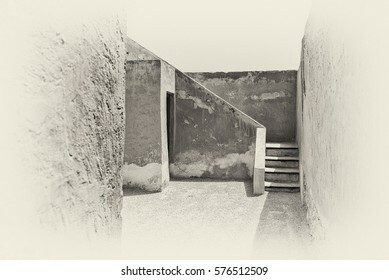 A sepia view of a stairway leading to the upper story of a traditional Arabian house with an old wooden storeroom door. 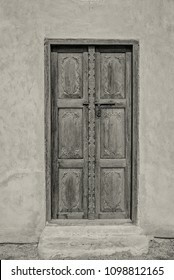 Black and white image of an exterior carved wooden door and step of a restored traditional arabian house. 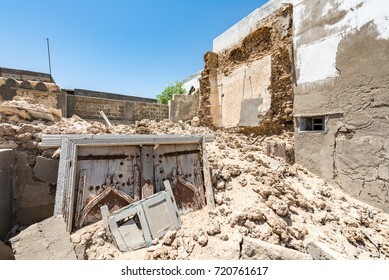 An old carved Arabian doorway lies buried in rubble from a demolished house. 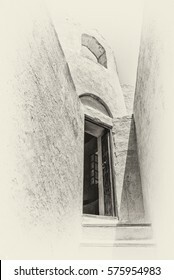 Sepia view of the arched entrance of Riffa Fort, Bahrain from the courtyard on a sunny day. 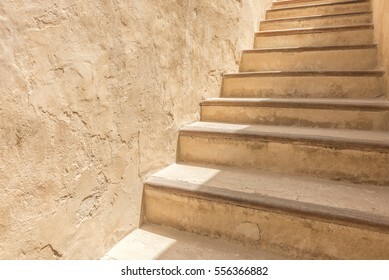 A stone staircase leads through adobe walls with a door and lattices for ventilation to rooms above. 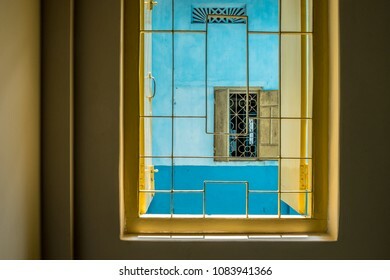 Exterior view of a yellow window with bars and no glass, and open yellow shutters in a two-tone blue wall seen through a window opening in a yellow wall. 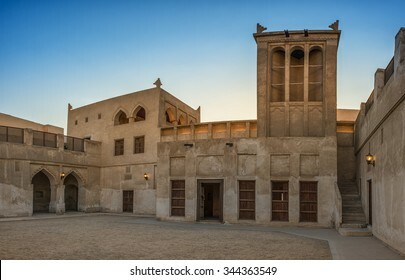 Wide angle view of the entrance of Riffa Fort, Bahrain from the courtyard on a sunny day. 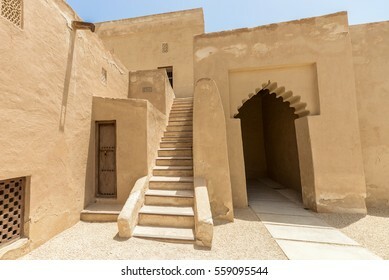 A stone staircase leads through adobe walls with a door and lattices for ventilation to rooms above. 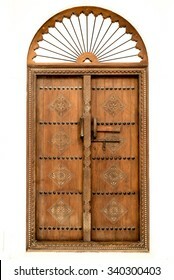 A traditional elaborately carved Arabian house door with brass door knockers and large brass door nails. 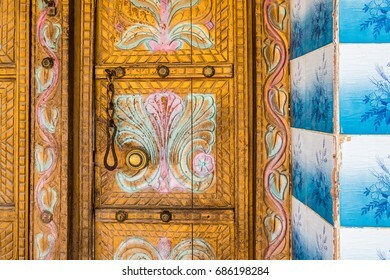 A cross process filtered view of an elaborately carved exterior door with a glass arch and a carved gypsum surround stands in front of a patterned, tiled floor in a restored traditional arabian house. 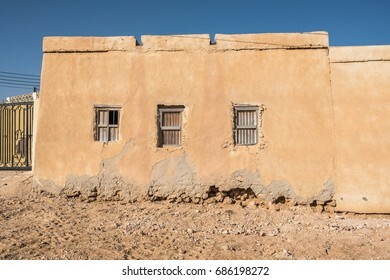 JANABIYA, BAHRAIN - 3 MARCH, 2017: A panoramic view of the upcoming Janabiya area of Bahrain showing apartment blocks, some under construction, and the desert. 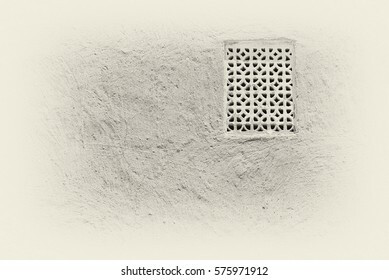 Sepia view of a gypsum plaster ventilation lattice in the adobe wall of a traditional Arabian house. 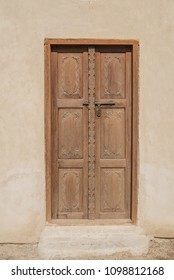 A traditionally carved Arabian door in the adobe wall of a restored building. 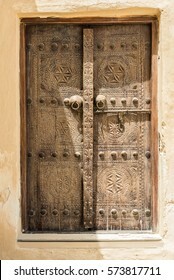 Strong sunlight throws shadows over the carvings, door handles and door nails. 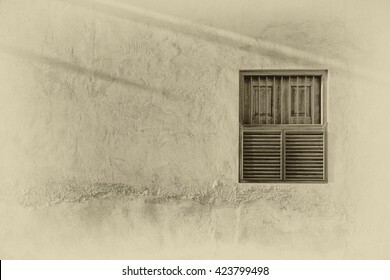 The warm exterior of a traditional house made of wood and plaster with a colour filter applied showing lattices made of wood covering windows. 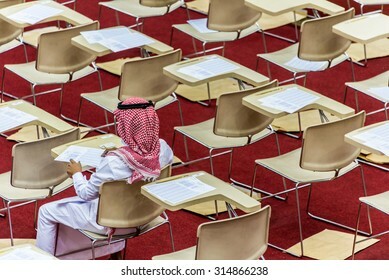 Taken at the Janadriyah Festival in Riyadh, Saudi Arabia. 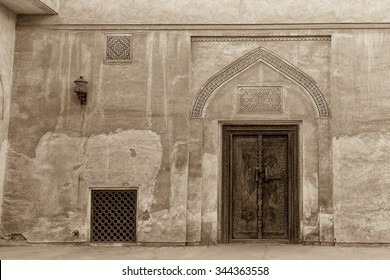 A sepia image of sunlight casting shadows from an elaborate arch near a traditional carved arabian door in the wall of a fort in Riffa, Bahrain. 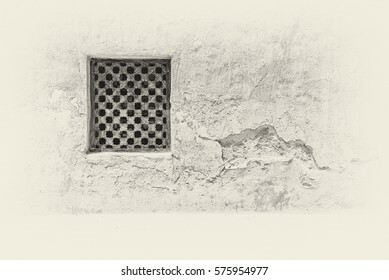 Sepia view of a lattice in an external wall which provides air and yet maintains privacy at the restored Shaikh Isa bin Ali House in Muharraq, the old capital of Bahrain. 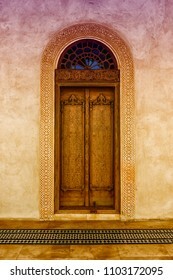 An exterior carved wooden door and step of a restored traditional arabian house. 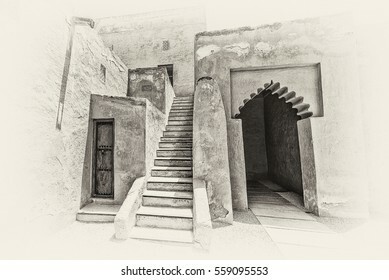 In this filtered, monochrome image, stairs lead to the roof from the courtyard of a restored traditional arabian house. 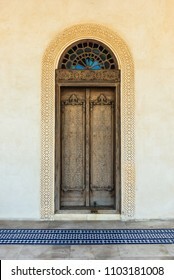 An elaborately carved exterior door with a glass arch and a carved gypsum surround in a restored traditional arabian house. 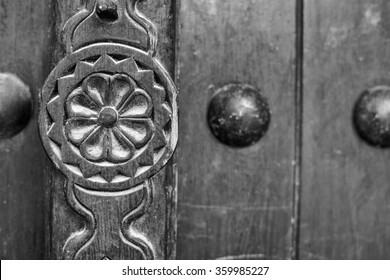 Sepia detail of a carving, doornails and lock on a traditional wooden Arabian door. 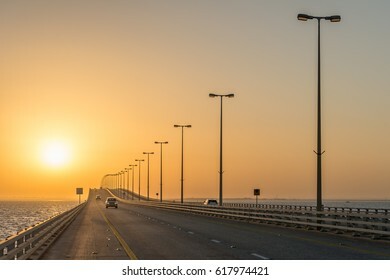 Panoramic view of traffic crossing the highest point of the King Fahd Causeway bridge between Saudi Arabia and Bahrain seen from the Causeway Island looking towards Saudi Arabia. 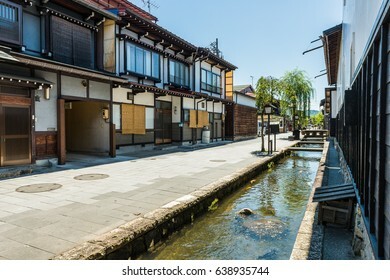 Carp swim in a stream running through a street with wooden houses in the old town of Furukawa in the Hida valley of Gifu Prefecture, Japan. 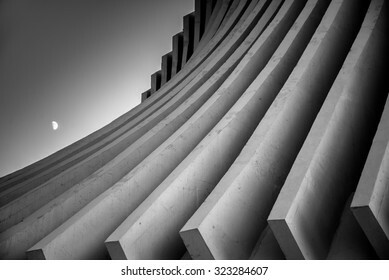 Black and white image of concrete roof beams sweeping down dramatically in curves with the moon rising in a dusk sky. 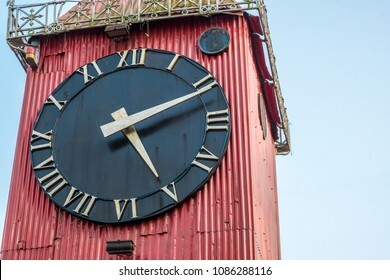 A close up of the black face of Ali Amjad's Clock the British Empire era red tin clock tower, a popular tourist attraction in downtown Sylhet. 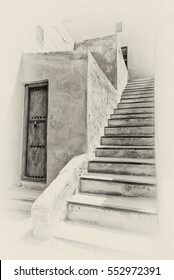 An adobe flight of stairs against a plaster wall of the courtyard of a traditional Arabian house. 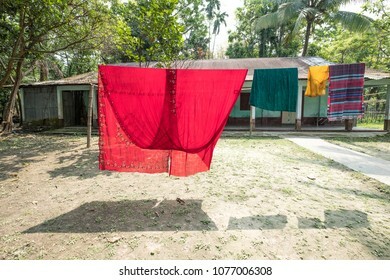 SYLHET, BANGLADESH - 9 APRIL, 2018: Colorful clothing including a sari hangs to dry on a line in the garden of a house with a tin roof and veranda. 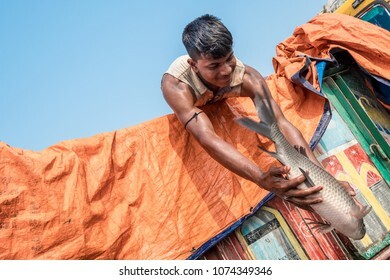 SYLHET, BANGLADESH - APRIL 9, 2018: A young fisherman with bare muscled arms throws a large live fish from the back of a truck to his partners at a fish market. 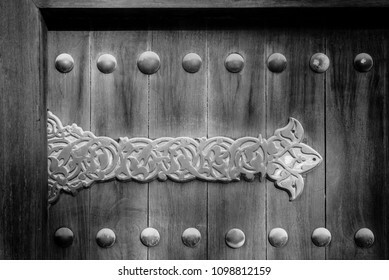 Sepia detail of a carving on a traditional wooden Arabian door. 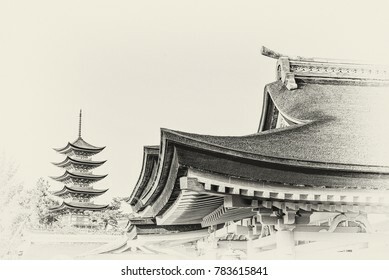 Sepia monochrome filtered view of the cedar roof and eaves of the Shinto shrine at Miyajima near Hiroshima, Japan with a pagoda in the background and some negative space. 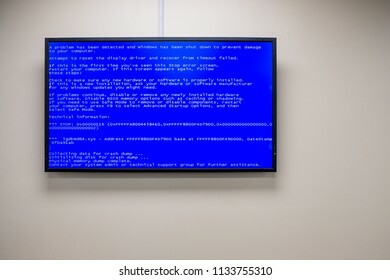 DHAHRAN, SAUDI ARABIA - 8 MARCH, 2017; A blue screen of death message displays on a wall-mounted monitor in an office. CAUSEWAY, BAHRAIN - 21 SEPTEMBER, 2016: Morning commuter traffic makes its way towards the border as the sun rises at dawn on the King Fahd Causeway highway bridge between Bahrain and Saudi Arabia. 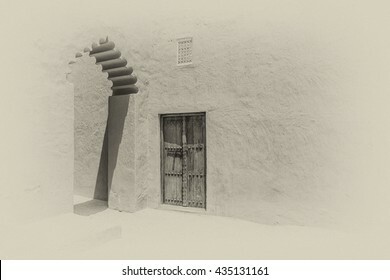 Sepia view of the narrow wooden doorway of a tower room at the top of some wooden stairs in a restored traditional Arabian adobe and plaster building. 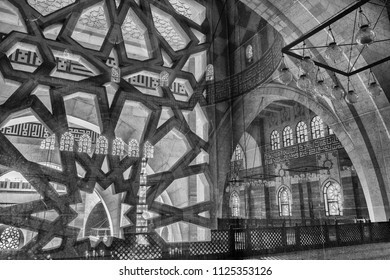 MANAMA, BAHRAIN - 20 DECEMBER, 2017: The interior arches and windows of the Grand Mosque reflected in the glass of an interior window with a stonework lattice looking out onto an internal courtyard. 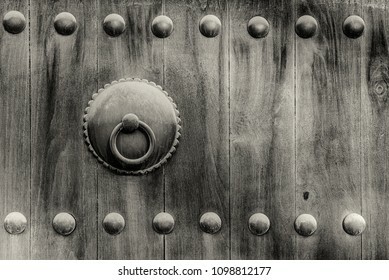 A black and white filtered view of a traditional elaborately carved Arabian house door with brass door knockers and large brass door nails. 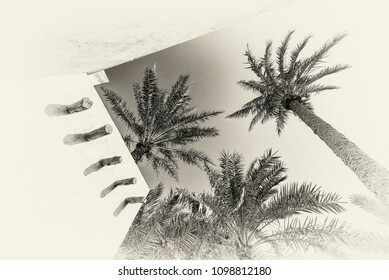 Looking upwards through the leaves of a palm tree towards a wind catcher, a traditional Arabian ventilation tower on a restored adobe building in the Arabian Gulf. 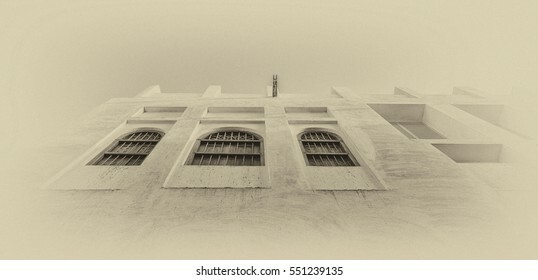 Sepia view looking upward towards three shuttered windows on an external wall of the restored traditional house of Beit Khalaf, Manama, Bahrain. 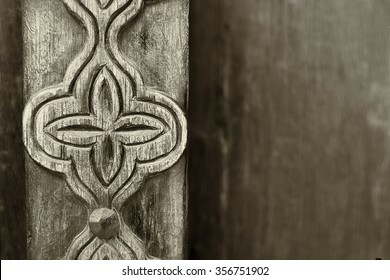 Sepia detail of a carved post in a traditional Arabian door. 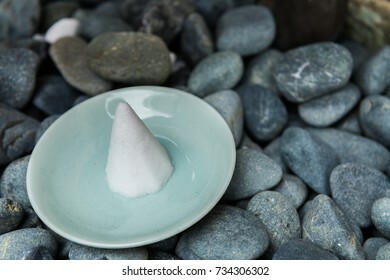 A tiny mound of salt on a small dish sits outside a house in Japan to cleanse the building and ward off evil spirits. 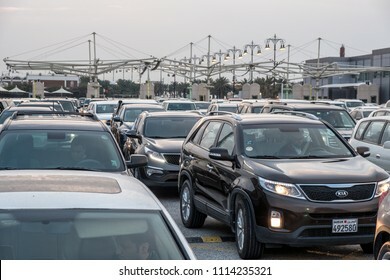 CAUSEWAY ISLAND, BAHRAIN - 25 FEBRUARY, 2017: Cars bound for Saudi Arabia wait in line at dawn on a congested morning at Bahrain passport control. 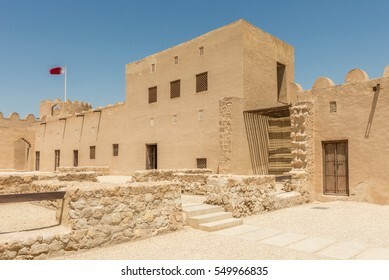 Interior courtyard of Riffa Fort, Bahrain on a sunny day with the Bahrain flag flying. 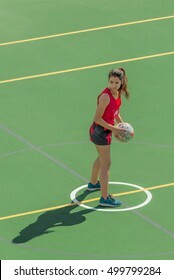 MANAMA, BAHRAIN - 4 MARCH, 2016: A young woman playing centre stands in the centre circle holding a netball and looks for her team mates to pass to at the start of a netball match. 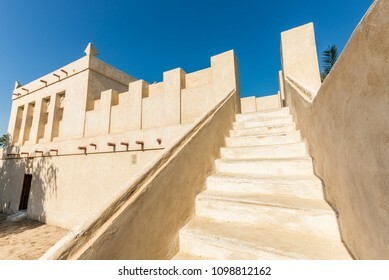 Stairs lead to the roof from the courtyard of a restored traditional arabian house. 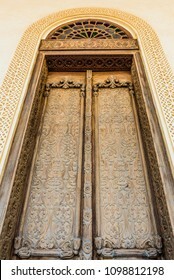 Detail of a carving on a traditional wooden Arabian door. 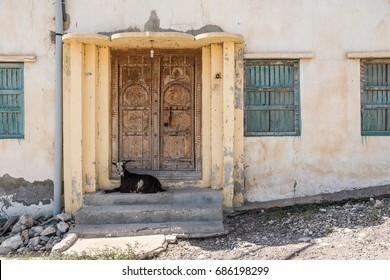 A goat sits on the top step of the entrance to a Middle Eastern house with traditional carved wooden door. 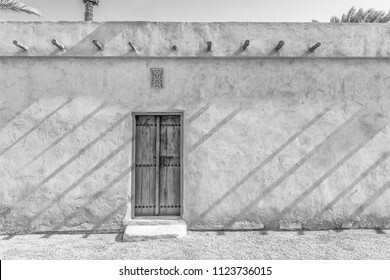 Sunlight casts shadows and brings out relief across an adobe plaster wall with a wooden shuttered window in the exterior wall of a traditional Arabian house. 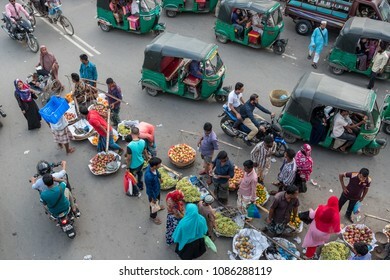 SYLHET, BANGLADESH - 9 APRIL, 2018: Seen from above, pedestrians buy fruit from market sellers on a street busy with rickshaw and motorcycle traffic. 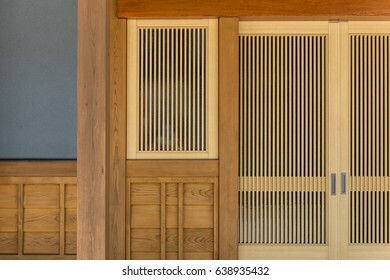 The wooden sliding entrance doors and window of a traditional Japanese home made from detailed pine carpentry. 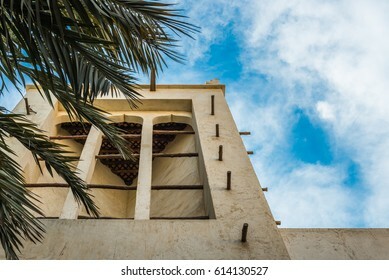 The wind-catcher tower at sunset over a courtyard of the restored traditional Arabian house of pearl trader Shaikh Isa bin Ali, Muharraq, Bahrain. 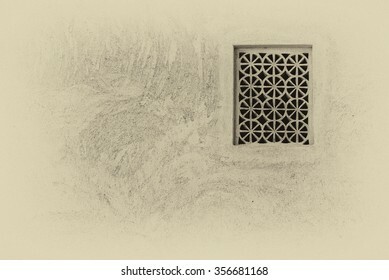 Sepia view of a carved wooden lattice covering a window in the crumbling adobe and plaster wall of an old restored building in the Arabian Gulf. 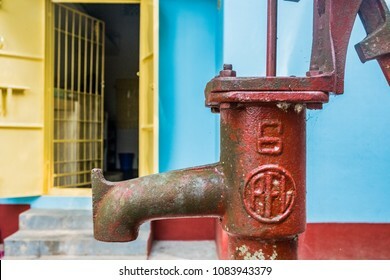 SYLHET, BANGLADESH - 9 APRIL, 2018: Close-up of hand-operated water pump standing in the concrete courtyard of a Bangladeshi house painted yellow, red and blue with the entrance to the kitchen behind. 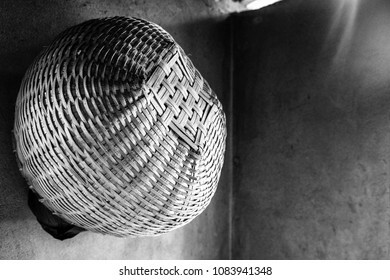 A black and white, push process filtered view of a handwoven spherical basket hanging against the corner of a shadowed interior wall. 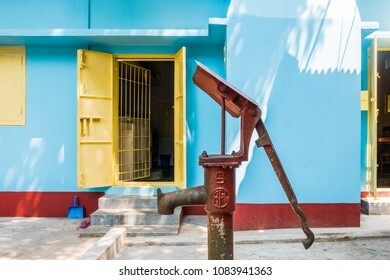 SYLHET, BANGLADESH - 9 APRIL, 2018: A hand-operated water pump stands in the concrete courtyard of a Bangladeshi house painted yellow, red and blue with the entrance to the kitchen in the background. 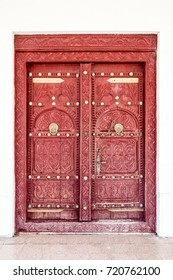 Traditional carved wooden Arab doorway of a restored house in Muharraq, Bahrain. 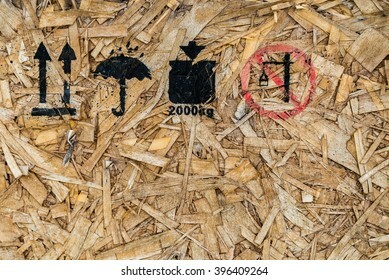 Black and red spray painted symbols showing keep upright, keep away from water, do not overload and do not lift on the side of a wooden box made from wood shavings. 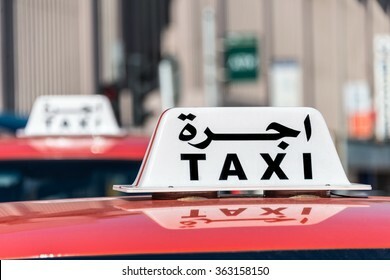 A sign on top of a red car says taxi in English and Arabic. 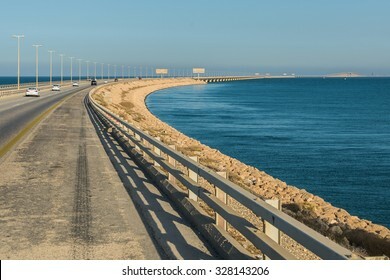 A view of the King Fahd Causeway between Saudi Arabia and Bahrain showing the view from Saudi Arabia. 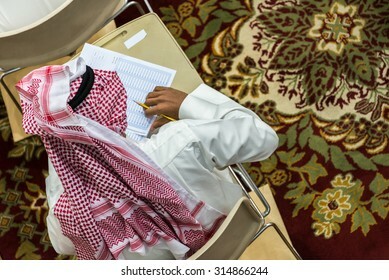 DAMMAM, SAUDI ARABIA - JULY 7: Saudi student wearing traditional thobe and headdress fills in his answer key in preparation for an examination on 7 July, 2015 in Dammam, Saudi Arabia. 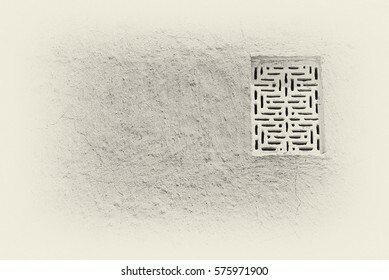 A lattice in an external wall provides air and yet maintains privacy at the restored Shaikh Isa bin Ali House in Muharraq, the old capital of Bahrain. 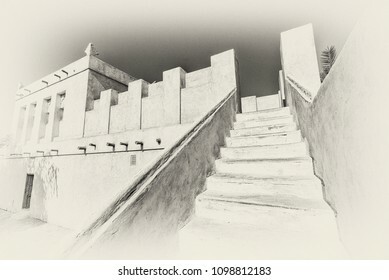 Sepia view of a stairway leading to the roof of a restored fort in the Arabian Gulf on a sunny day. 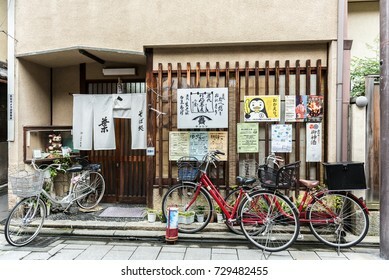 KYOTO - 17 JULY 2016: A street scene with bicycles outside an izakaya or traditional Japanese bar in the old Gion area of the city. 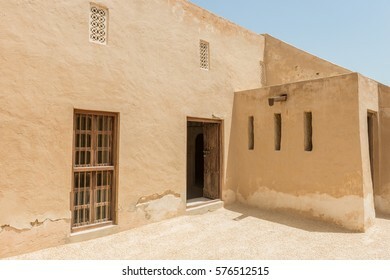 Entrance to rooms on the roof of a restored fort in the Arabian Gulf in strong sunlight. 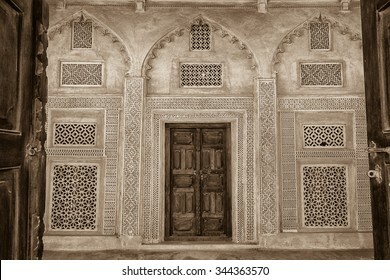 There are wooden doors and windows and carved gypsum lattices for ventilation. Sepia view of latticed windows and entrance seen through a doorway to the ladies' quarters of the restored traditional Arabian house of pearl trader Shaikh Isa bin Ali, Muharraq, Bahrain. 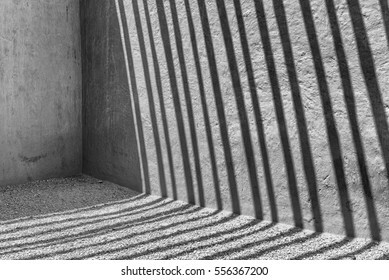 In this black and white image, sunlight throws diagonal shadows from roof beams across a wall and gravel floor in the corner of a traditional Arabian house. 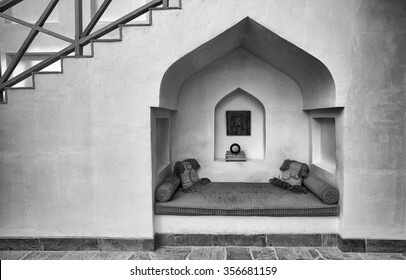 MUHARRAQ, BAHRAIN - 19 DECEMBER 2015: Black and white view underneath some stairs where an alcove in a restored building in Muharraq, the old capital of Bahrain, provides a welcome retreat. 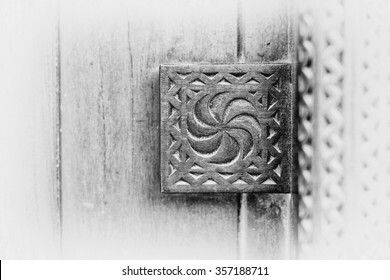 Black and white detail of a carving on a traditional wooden Arabian door. 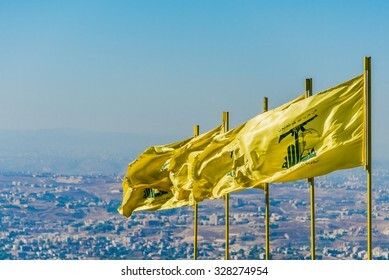 MLEETA - SEPTEMBER 26: Hezbollah flags over southern Lebanese land. 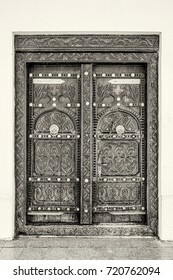 The Arabic text reads "Then surely the party of Allah are they that shall be triumphant" and "The Islamic Resistance in Lebanon." 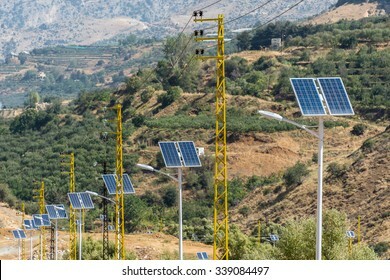 A row of solar-powered street lights descends a mountain road with yellow electricity pylons in rural Lebanon. 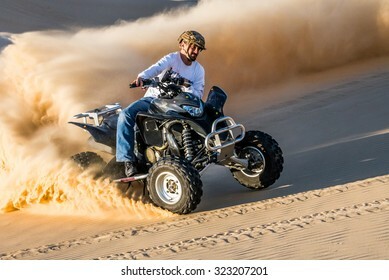 SHEDGUM - DECEMBER 19 2014: A quad bike rider creates a cloud of sand during a turn while riding in the deserts of Eastern Province, Saudi Arabia. 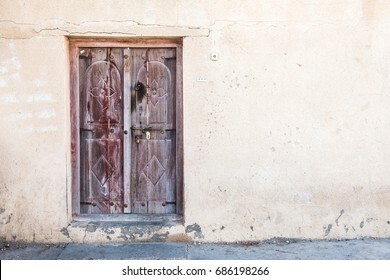 Carved wooden door and ornate plasterwork adorn a doorway in a courtyard of the restored traditional Arabian house of pearl trader Shaikh Isa bin Ali, Muharraq, Bahrain. Panorama of the beach of Saltburn-by-the-Sea, Redcar and Cleveland, England, UK at low tide showing the pier, cliffs and sea front at sunrise. 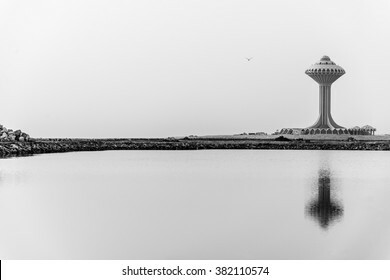 A water tower reflected in a pool of water on reclaimed land on the Arabian Gulf coast north of the Corniche in Al Khobar, Eastern Province, Saudi Arabia. 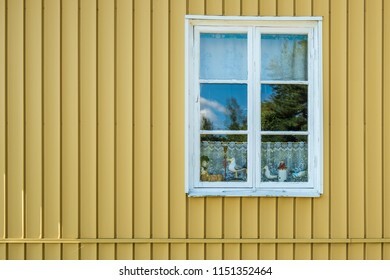 VAXHOLM, SWEDEN - 11 AUGUST, 2018: A window in the wall of a traditional Scandinavian house displays wooden carved ornaments against a lace curtain. 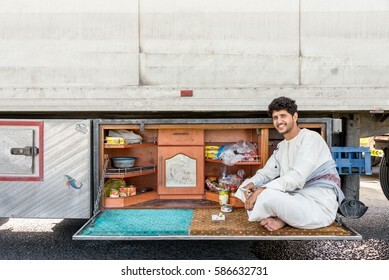 CAUSEWAY ISLAND, BAHRAIN - 29 DECEMBER, 2016: A Yemeni truck driver takes a break with a cigarette in his portable kitchen with cupboards of food while waiting at customs to cross into Saudi Arabia. 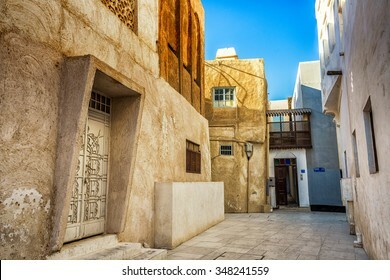 MUHARRAQ, BAHRAIN - 15 NOVEMBER, 2015: An alleyway and buildings in the restored area of Muharraq the old capital of Bahrain.